Apparently I’m not at all alone, because many people have asked me about how to have a coherent wardrobe strategy when you dress for such a wide variety of activities. So I chose one of the very beautiful paintings suggested to me, and went to work. This painting is an innovative combination of accent colors, some interesting asymmetry, and a wide range of grey through beige and taupe neutrals. First up – the gym! 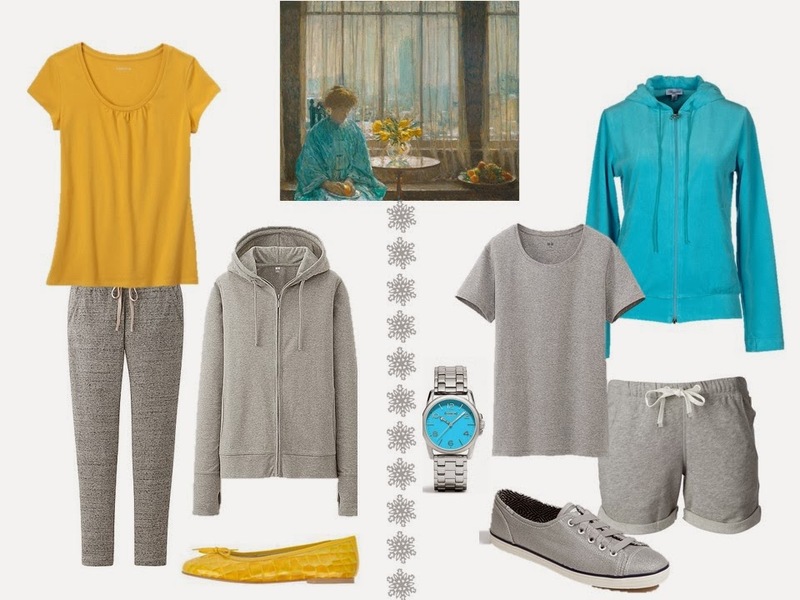 Being able to use grey as a neutral is wonderful, because it’s the quintessential color for sweats. But you can always introduce the beautiful daffodil and turquoise for a little bit of personal signature and life. When you have to go out in public and sweat clothes just won’t do it, a simple skirt and draped top, or a classic sweater and pants, are easy choices. And then evenings can still be relaxed. A dressy version of a sweatshirt, jeans that aren’t blue, and comfy flats will work for a lot of activities. If you absolutely, positively have to look “dressy”, a dress in your accent color with some AMAZING asymmetry is comfortable, especially coupled with flat sandals. 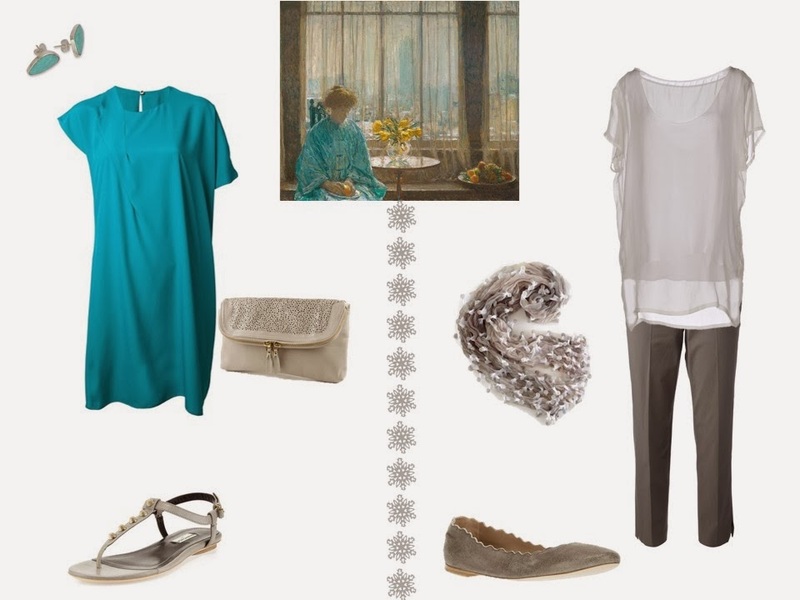 A drapey dressy blouse, some high-quality capris, a beautiful scarf and some flats are very useful for anything from a nice lunch to a concert or date. This is lovely…these colors make me believe Spring will arrive. One request…when you use paintings, they have two or more colors that work with the overall neutral. 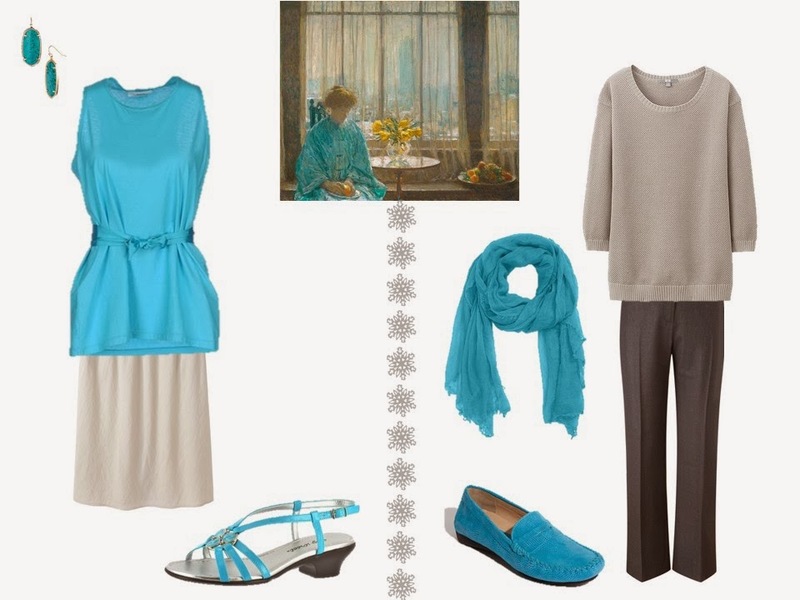 How would you, for example, use both the yellow and turquoise in one outfit? Thanks! When I suggested this painting, I never dreamed you would come up with such a beautiful array of combinations! I love the idea of "dressing" for the gym. Isn't the point of exercise to feel good about one's body and health? And who can feel good about themselves in ratty gym clothes?! Off to re-vamp my workout gear. Thanks for using The Breakfast Room so beautifully. I love these new wardrobes based on about 20 garments. That leaves 13 carry-over or special purpose items to make a 33. There are still plenty of options with 15-20 garments in a core wardrobe. Are you up for a rather unusual challenge? I'd love to see a wardrobe designed for outdoor pursuits: bicycling, boating, hiking, skiing, etc. Throw in outdoor concerts, Sundance, picnics and barbecues as the most likely entertainments. Dressing for these outdoor activities can be a particular challenge as temperatures and weather changes challenge even the best prepared! I thoroughly enjoy all your posts. My wardrobe is the most versatile and flexible it has ever been. Thank you. I love this idea! You have described my lifestyle and clothing needs so I'd love more capsules with cute, technical clothes! This is lovely and imaginative, but I personally have a problem with the mix with anything technique. When I get done at the gym, my clothes stink! They just get beat up and the underarms, well..I don't think I'd ever mix and match them with streetwear. Similarly, I work from my home office. When clients come, I dress as I would in any business office, but working at home on other days with two cats and a dog and the inevitable repair projects that come up every week–well, let's say I wouldn't wear a cashmere twin set every day. I do try to wear nice jeans or khakis and a nice sweater (in case someone drops off stuff), but if I wore the good stuff every day it would wear out really fast and look like a rag much quicker. Which is why the 333 project always seemed un-doable and at my house would result in nicer things being ruined faster. My daffodils are peaking about one careful inch above ground right now and these lovely colors fit right in. I have a Patagonia sweatshirt in turquoise and I feel good in it every time I wear it. Such an uplifting color and one that looks good on just about anybody. The painting is beautiful. I am not usually a fan of yellow but love grey and turquoise. These pairings make me want to add a piece or two of bright yellow though. Gorgeous as usual. This would be an excellent vacation wardrobe. It would cover almost anything I do while on vacation, from morning exercise, hikes, general lazy day sightseeing and shopping, to theater and concerts. Lovely and versatile, just switching to my core colors rather than yellow and turquoise and (importantly) packing fewer shoes. Thanks Janice! I used to get an e-mail from the Vivienne Files when you issued a new post. That seems to have stopped working and I don't see a place to resubscribe? Can you let me know how to do this? I encountered the exact same; I thought it was my computer but I guess not. Oddly, I didn't receive your posts for a few days, then they all came in a lump which is why I'm late in commenting on this one. I'ld love to see more posts built around these types of varied activities. Retired for three years, I spend a fair amount of time looking after a 4 year old so stick to LLB t shirts and casual pants for that activity – no point in wearing anything nicer. Then there are the other parts of my life – shopping, going to stretching class, meeting friends, etc. Often several of these activities occur in the same day so I need clothes that look good, make me feel good and work for a variety of situations. I also walk or take transit most of the time which makes a big difference in what you wear and the bag you carry. Hope to hear more from you along these lines. Thanks. Wow – I love this! The grey base looks so easy to work with! Great trip combo. I always wish the painting were a scarf again, in this case, not the exact motif but definitely the colours. I can tell you much prefer grey to taupe. When I look at the picture I don't actually see any grey, just different sands, creams, khakis. But that is maybe because that is what I lean towards, and it is easy for me to substitute in my mind. Thank you for another visual treat!